The first Lincoln MKZ debuted in 2006 with the moniker "Zephyr." The first generation of this type vehicle became known as the MKZ from 2007 through 2012. When considering the purchase of a used Lincoln MKZ it should be noted that the early versions of this car are mechanically very similar to a Ford Fusion. The cars exteriors were somewhat the same as well. The front and rear facades had their unique features. However, it was very difficult to distinguish one from the other when looking at the profile views. 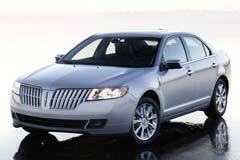 A used Lincoln MKZ made in 2010 and beyond will be substantially different from the earlier editions. Prior to that model year, the MKZ had a square grill, retro looking instrumentation panel and the quality of the materials was questionable. Beginning in 2010, the MKZ was made more contemporary and brought up to the high standards the Lincoln brand is known for. Under the hood of a used Lincoln MKZ of 2010 and beyond you will find a 3.5L V6 capable of producing 263HP. The engine was mated with a 6 speed automatic transmission and featured front wheel drive. All wheel drive was optional. A Sports Appearance Package was also offered which, besides the sportier look, came with a sports tuned suspension and 18" alloy wheels. If you are looking for a car that is both fun to drive and offers an abundance of equipment for the money, a used Lincoln MKZ might be the car for you. 2010 Cadillac CTS 1OWN ONLY 30K MILES STS DTS NON SMOKER MUST SELL 2010 CADILLAC CTS 1OWN ONLY 30K MILES STS DTS NON SMOKER MUST SELL NO RESERVE!